Contents and Media: EC#150 contains one waterslide decal sheet of national markings, codes and other aircraft-specific markings and one double-sided A3 fold out full-colour instruction sheet with marking options for three aircraft. EC#151 as above, but with two decal sheets. Advantages: Interesting subject choices, which include the three F4Us covered in Tamiya’s recent 1/32 kit; comprehensive instructions; high quality decals. 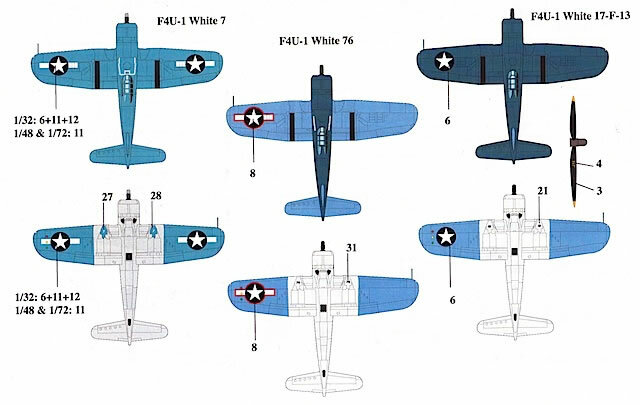 Conclusion: These 1/32 sets should be considered by anyone who’s purchased the Tamiya F4U kit and is looking for alternative markings or wants to upgrade from the kit decals. EagleCals has delivered two comprehensive packages that feature interesting aircraft, high quality decals, and well-executed instructionss. The F4U-1 Corsair first saw action in early 1943 during the Solomon Islands campaign. While still being refined for carrier use, the type was used successfully by Marine units from airstrips on Guadalcanal, New Georgia, and elsewhere in the Solomons. The tempo of operations and harsh tropical environment subjected the Corsairs to high rates of wear and tear, with period photos revealing even comparatively new aircraft as heavily weathered, stained and patched. The worn appearance of these F4U-1s makes them attractive but challenging modelling subjects. The situation is further complicated by the variety of field-applied camouflage and markings, which can be difficult to interpret from 70-year old black and white photographs. 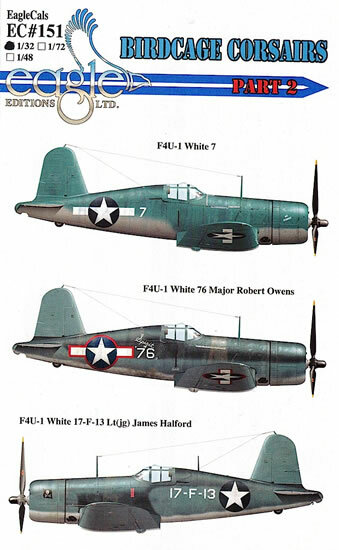 The exact colours of some otherwise well-documented F4U-1s are still debated today. 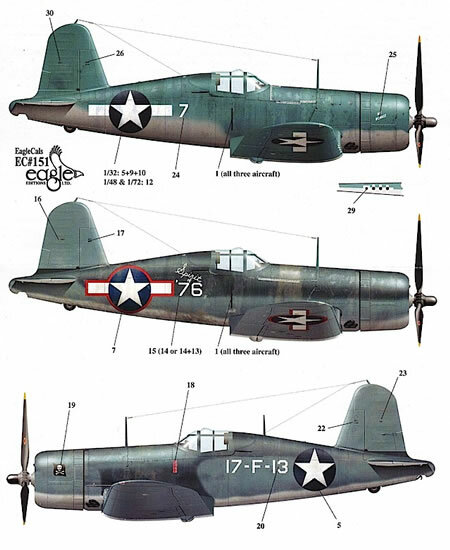 EagleCals ‘Birdcage Corsairs’ Parts 1 and 2 provide markings for six representative F4U-1s. All were based in the Solomon Islands during 1943, apart from a VF-17 aircraft flown off USS Bunker Hill in the same year. 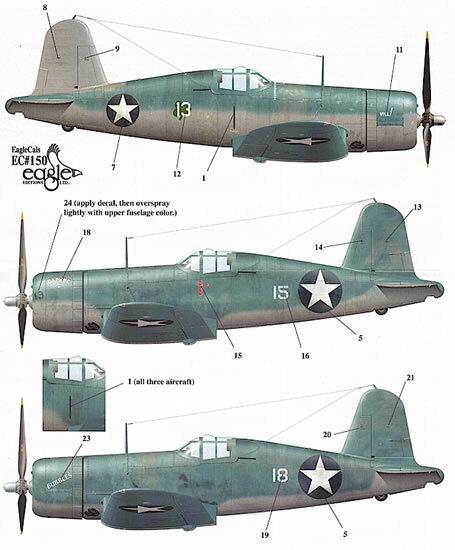 EagleCals has released the decals in all three major scales, with the 1/32 sets examined here. White 13/‘Viva’/BuNo 02310 flown by 2nd Lt. Ken Walsh of VMF-124, Guadalcanal, Solomon Islands, May 1943. The only aircraft for which I couldn’t find a photographic reference, ‘Viva’ had a mid-level colour demarcation on the fuselage sides, and a Light Gray vertical stabiliser. The instructions suggest that replacement cowls had likely been fitted to the left and right sides of the engine, and that the paintwork was chipped and discoloured. White 15/‘Daphne C’/BuNo 03829 flown by Capt. James Cupp of VMF-213, Munda, Solomon Islands, September 1943. Cupp named this aircraft after his wife, with the cowl bearing her name coming from one of the pilot’s earlier machines. The fuselage colour demarcation on this and the following F4U-1 was lower than on ‘Viva’, and their vertical stabilisers were Blue Gray. 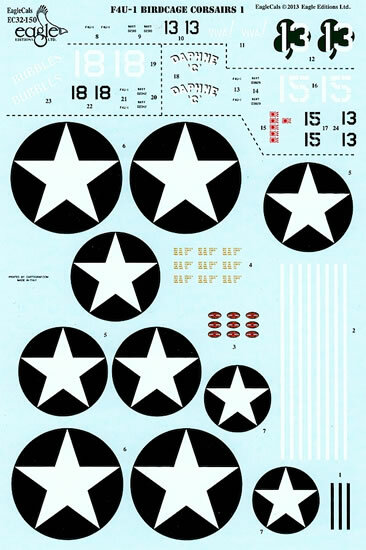 ‘Daphne C’ is one of the machines featured on the decal sheet for Tamiya’s superb 1/32 F4U-1 kit. White 18/‘Bubbles’/BuNo and pilot unknown, VMF-124 or VMF-213, Guadalcanal, Solomon Islands, early 1943. Again, this aircraft was heavily stained and faded. White 7/‘My Bonnie’/ BuNo and pilot unknown, VMF-124, May 1943. ‘My Bonnie’ was camouflaged in Blue Gray over Light Gray, with the fuselage colour demarcation somewhere between that on ‘Viva’ and ‘Bubbles’. Two different styles of ‘7’ were painted on the forward gear doors, which were a darker colour – possibly Dark Blue – than the surrounding Light Gray surfaces. 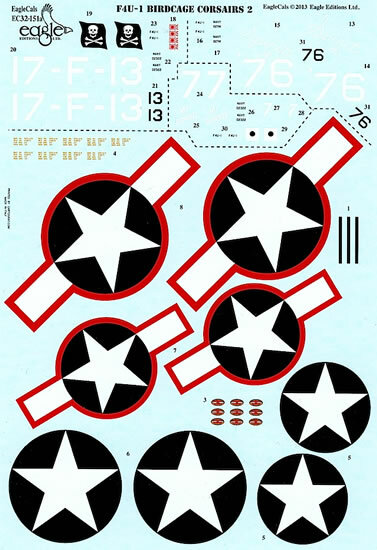 The lower outer wing panels were Blue Gray, and the national insignia was carried in six places with non-standard white bars on the sides of each insignia. White 76/‘Spirit of ‘76’/BuNo 02714, flown by Major Robert G. Owens Jr., CO of VMF-215, Munda, Solomon Islands, August 1943. ‘Spirit of ‘76’ is arguably the most enigmatic F4U-1 on these sheets in terms of camouflage and markings. 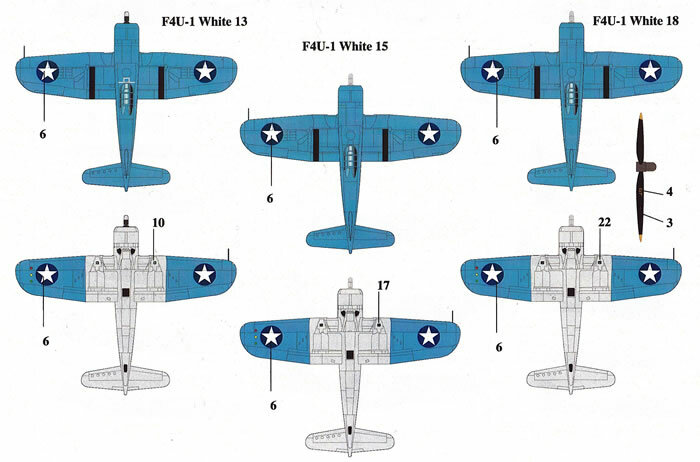 The scheme in which it is portrayed here is described by EagleCals as ‘provisional’: ‘a field-applied three tone pattern with Dark Blue on the upper fuselage, Intermediate Blue on the fuselage sides and upper wings and Light Gray or White under the fuselage and non-folding portion of the wings’. ‘Spirit of ‘76’ is another of the aircraft featured on Tamiya’s 1/32 decal sheet. However, EagleCals has a different take on the colour of the outline around the national insignia, which it interprets as red rather than the lighter blue presented by Tamiya. Period photos show a difference in colour between the fuselage insignia and the surrounding border – which appears to have been hand-painted, and quite roughly in places. It is impossible to say what this colour was, so it’s good that EagleCals has provided an alternative to the Tamiya decals. The photos also reveal that ‘Spirit of ‘76’ was exceptionally weathered and patched, with tape used in several places. 17-F-13/BuNo unknown, flown by Lt (jg) James Halford of VF-17, August 1943. The only carrier-based machine in these sets, ‘17-F-13’ was flown by Halford on USS Bunker Hill during VF-17’s qualification cruise. The aircraft was reportedly freshly painted in the three-tone scheme of Non Specular Sea Blue over Intermediate Blue and White, and is the last of the schemes chosen by Tamiya for its 1/32 kit. 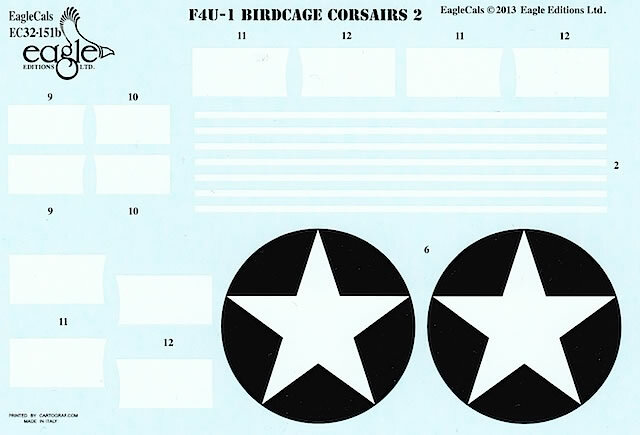 At this point it’s worth contemplating why EagleCals allocated 50 per cent of the markings on these sheets to aircraft already covered in Tamiya’s 1/32 F4U-1 kit. It’s not an oversight or coincidence, because the kit and decals were released within months of each other last year. I think the answer is choice: the EagleCals decals give modellers an alternative source of markings if they want to do the Tamiya-featured schemes but are reluctant to use the kit decals. (I don’t have much experience with Tamiya decals, but many modellers don’t like using them.) EagleCals has addressed at least one point of contention in Tamiya’s interpretation the colour of the borders of the national insignia on ‘Spirit of ‘76’ – and there are also minor differences in font shape between some of the Tamiya and EagleCals decals. Ultimately, it’s up to the modeller to decide which company’s decals he or she uses. The decals themselves are up to EagleCals’ usual high standard. The decals for Part 1 are printed on a single sheet, while two sheets are needed for Part 2. All decals have been printed perfectly with no apparent flaws. Colour density and demarcations are good, with smaller markings such as the manufacturer’s logo on the propeller blades and Japanese flag kill markings crisply presented. The non-standard white bars that go on either side of the insignia on ‘My Bonnie’ have been printed as separate decals (one per side), and will require careful alignment. The red borders around the insignia for ‘Spirit of ‘76’ are perhaps too neatly done compared to photos of the real thing, but this isn’t a major problem. A number of white decal strips are supplied for depicting tape if modellers wish to do so. The instructions are a highlight of EagleCals sets, and these are no exception. Port or starboard profiles are provided of each aircraft, along with generic overhead, undersurface, and propeller painting guides. Enough information is supplied about each machine to satisfy most modellers, and those who wish to conduct further research will have plenty of material to get them started. As a minimum, I’d strongly recommend finding photos of the F4U you are modelling, because the profile illustrations can’t show the grime and weathering on these machines as it really was. 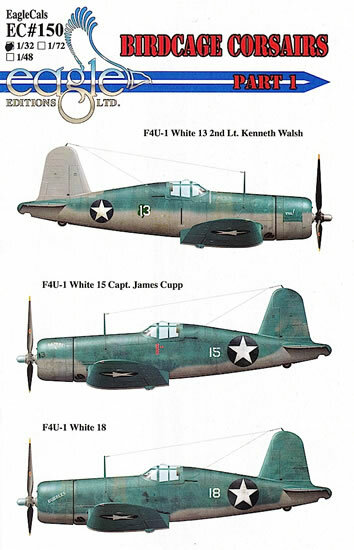 These two 1/32 EagleCals sets should be considered by anyone who’s purchased the Tamiya F4U kit and is looking for alternative markings or wants to upgrade from the kit decals. The sets are a comprehensive package featuring interesting aircraft, high quality decals, and well-executed instructions, and can be highly recommended.